In the popular culture, the American West is a setting used throughout the ages as a metaphor for today’s issues. The indomitable American spirit is on display in its most vital form, usually including perilous dangers and the actual and very real threat of death or disease. If you look for the metaphors, you can certainly find them. However, sometimes a story is just a story and I recently experienced all the emotions that good stories can deliver. In this most recent case, they were delivered visually through a television mini-series and an anthology film. The first, “Godless” is a series that was introduced about a year ago and which I had identified as something worth checking out. I am glad I did! I’m not too manly to admit that I teared up at the final installment, due to the fantastic job that the creators did in fashioning some wonderful characters and some intriguing storylines. The story centers on the Western town of La Belle, New Mexico. The majority of its inhabitants are women who have lost their husbands to a tragic silver mine disaster. While these women strive to recover from their misery and salvage their town, a madman and his gang are on the loose and on a collision course with the town folk. Over seven episodes, we meet and begin to grow fond of a sheriff who is slowly losing his sight, a deputy who thinks he can outshoot all comers, the mayor’s widow who strives to model self-sufficiency to her fellow widows, and a laconic and reluctant hero, of course. I enjoyed every minute. The second is the latest film from the Coen Brothers, “The Ballad of Buster Scruggs.” This anthology film was initially conceived as a mini-series and presents six individual stories of the West- and in classic Coen Brothers style, skewers all conventional ideas of the West. 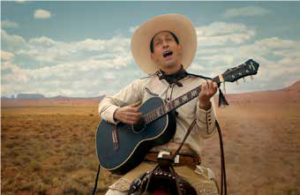 The first story features Buster Scruggs, a singing cowboy who had a deep and dark violent streak and gets the film off to a rousing start. The stories that follow show a gold prospector played by musician Tom Waits, a wagon train heading west and meeting with trouble, a stagecoach ride which may or may not be a journey to an afterlife, a travelling show proprietor (played wordlessly by Liam Neeson) and his “meal ticket” (played wonderfully and impressively by Harry Melling, who was Dudley Dursley in the Harry Potter films), and James Franco as an inept bank robber. The Coen Brothers have never met a character they couldn’t put through trials of a cruel nature even though they may be simple and innocent and worthy of just one darn break. You’ll find yourself enthralled by the fantastic photography of the Western scenery, and awed by what the people who travelled west had to endure for their dreams of freedom and opportunity. Both of these fine entertainments are available through Netflix, and are well worth your time if you want to step away from today’s holiday distractions and return to wonderful story and setting.